Last year, instead of taking a family vacation, we decided it was a better idea to have Charlotte and add her into the family. We were blessed to be able to take some time off of work first thing after she was born, which sort of took the place of going on vacation. Charley's face pretty much sums up our excitement for vacation! And while we wouldn't trade it for anything, we were definitely ready to get out of town for a few days this year. Kyle and I started talking early in the year about where we wanted to go. 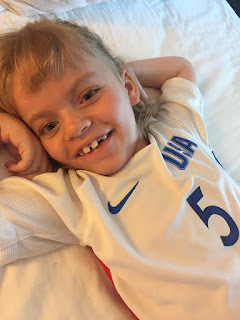 Our dream option was taking Grace back to the Disney resort Aulani in Hawaii, where she had her Make-A-Wish trip, but we thought the two long plane rides might be really tough on Grace. In fact, we talked about a lot of places, like Myrtle Beach, Texas, and even Universal Studios in Florida to see the Wizarding World of Harry Potter, since we have been reading those books to Grace for the past few years. 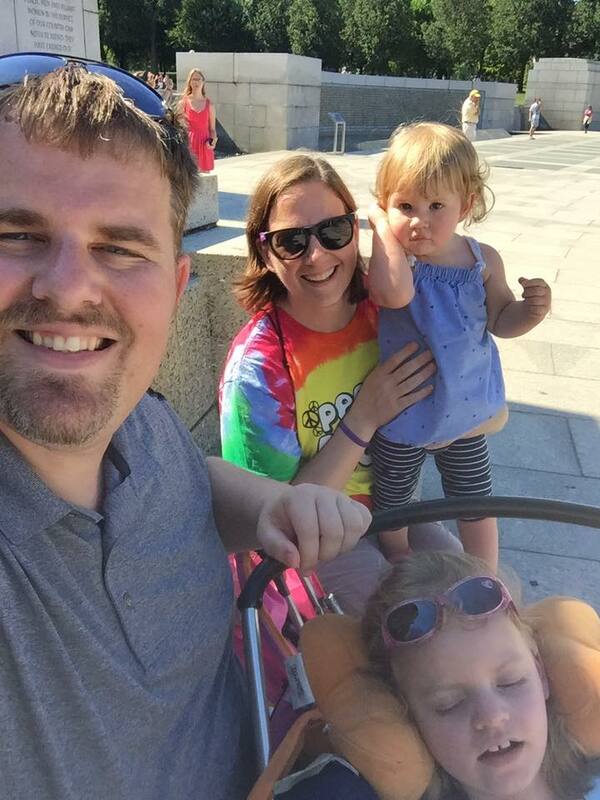 We ended up thinking that might be a better trip when Charlotte is older than one. We had SO much fun visiting John and Emily. In the end, it was a comment that my brother made when he was home at Christmas that pushed us toward Washington DC. 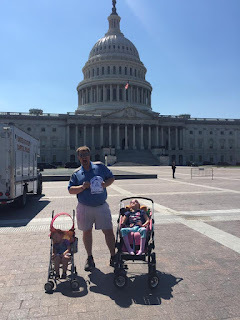 Johnny is serving on Capitol Hill this year as a legislative fellow, and he told us this was the year we should come and see him and get a tour of the Capitol. We figured neither of our girls would get much out of that, but we knew Kyle and I would love it. And we thought it would be a great chance to spend more time with Johnny and Emily. Watching a World Cup soccer game together. Grace looked so cute in her soccer jersey. 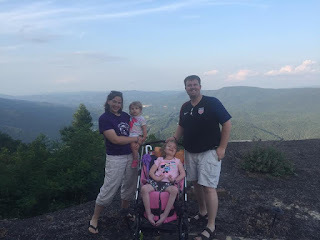 Since Grace's medical stroller doesn't fly very well, we made plans to drive the 12 hours to the east coast in July and enjoy some fun stops along the way. 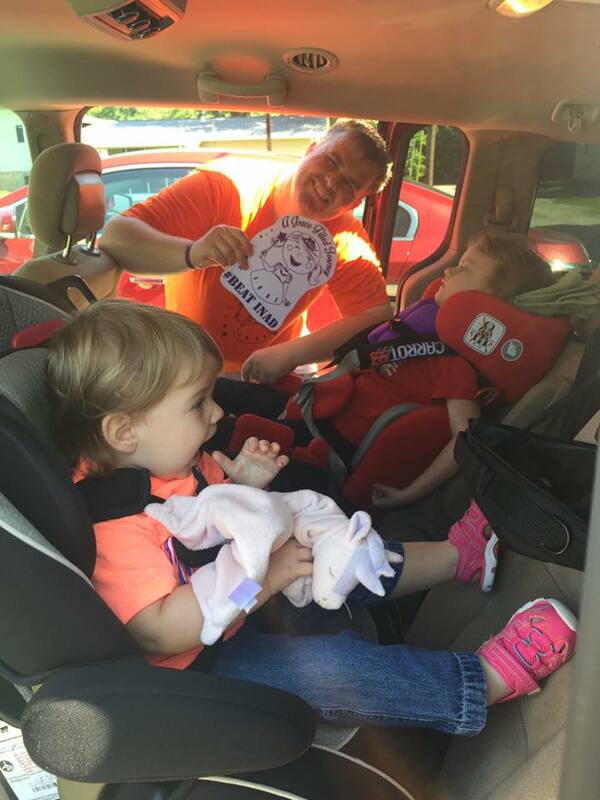 And since Kyle and I don't do much of anything without trying to raise more awareness for INAD, we brought Flat Gracie along with us for the ride. Similar to the idea of Flat Stanley, we printed out the Princess Grace logo, and used the hashtags #flatgracie and #beatINAD on our posts from our trip. It was a lot of fun, and I think many of Grace's followers enjoyed seeing where we took her. Hanging out with some presidents at the Nationals game. 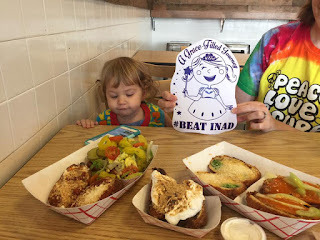 Fortunately, the drive both ways was very uneventful, and included a few fun places to eat. 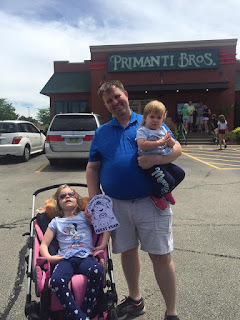 Kyle had seen Primanti Brothers on Food Network, so we made a detour in Pennsylvania to try one of their restaurants, where Kyle had a sandwich with the fries already on top! 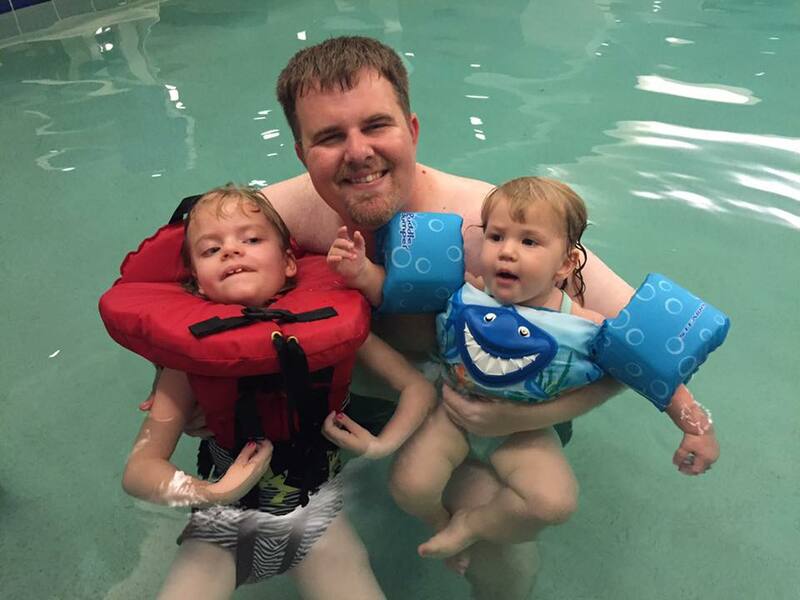 We also enjoyed swimming at the hotel with the girls, and just generally being together away from all the usual routine. 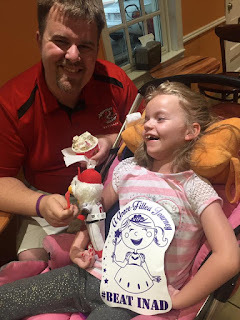 We spend a lot of time during the week making sure Grace gets to therapy appointments, and I have to say that it was nice for one week not to have much of a schedule. Checking out the World War II Memorial. With Grace's feeding schedule and the fact that Charlotte is one, we didn't really plan to see many sites in Washington DC, but we picked a few things we thought would be fun. 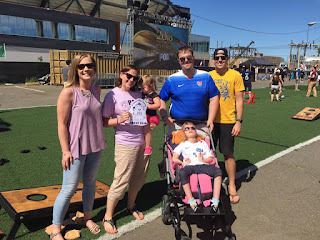 Johnny and Emily took us to the new DC United soccer stadium, where we watched a World Cup game together outside, and we enjoyed meeting the Presidential mascots at a Nationals game on a beautiful Sunday afternoon. As hot as this summer has been, we couldn't have asked for better weather on our trip. When Johnny and Emily went back to work during the week, we decided to venture out on our own, which worked pretty well until Charley threw up on the Metro about halfway to our destination. But we made the best of it, and still managed to see a few of the historic monuments after getting her all cleaned up. We had hoped to make it back to the Newseum, which is one of our favorite stops, but we just ran out of time. Cheesing in front of the Capitol. The view from the speaker's balcony. We had a chance to meet up with Congressman Davis. 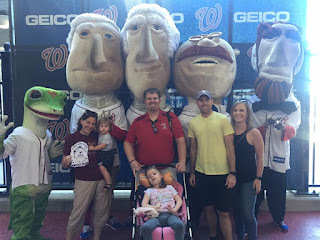 Johnny gave us an awesome tour of the Capitol one day, that definitely lived up to the hype. 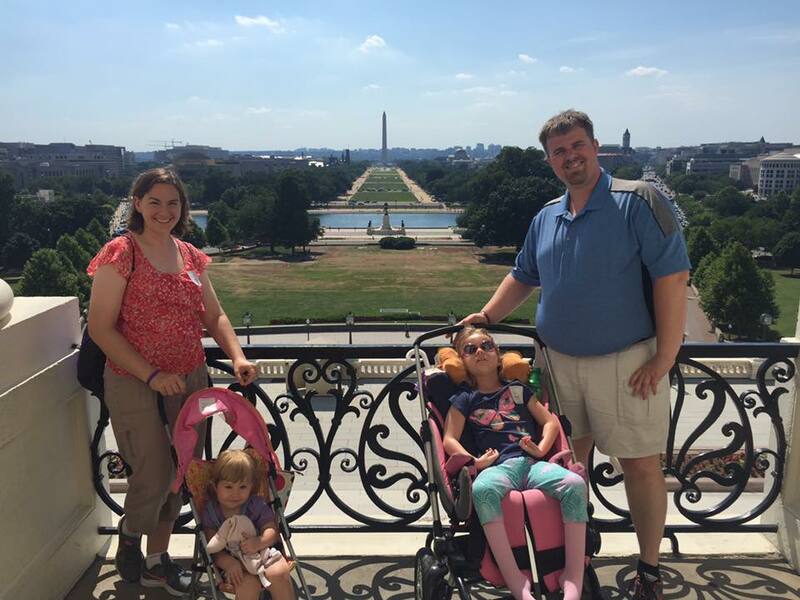 We had a great view of Washington DC from the speaker's balcony, and Senator Elizabeth Warren said hi to Grace and Charlotte when we were leaving the Senate building. 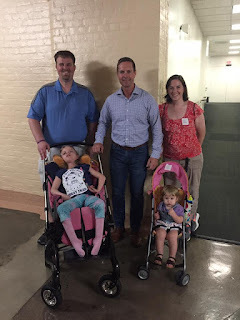 We also had a chance to meet up with Congressman Rodney Davis, who gave an awesome speech about Grace in February in honor of Rare Disease Day. It's great to have people like him in our corner. 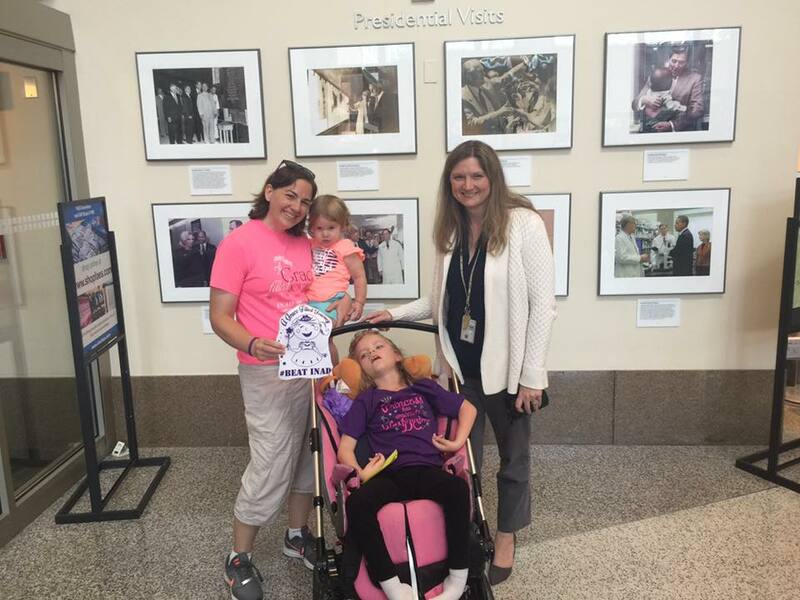 We loved meeting up with Dr. Kozel at the National Institute of Health. We had a great time at the National Institute of Health. Before heading out, we stopped to visit Grace's former geneticist at the National Institute of Health. She's one of our very favorite doctors, so it was wonderful to catch up with her and hear more about her research with Williams Syndrome. 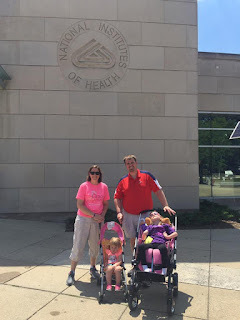 It was also just incredibly awesome to be at the National Institute of Health, thinking about all the amazing cures and treatments that are found for devastating diseases. It was definitely a highlight of the trip. 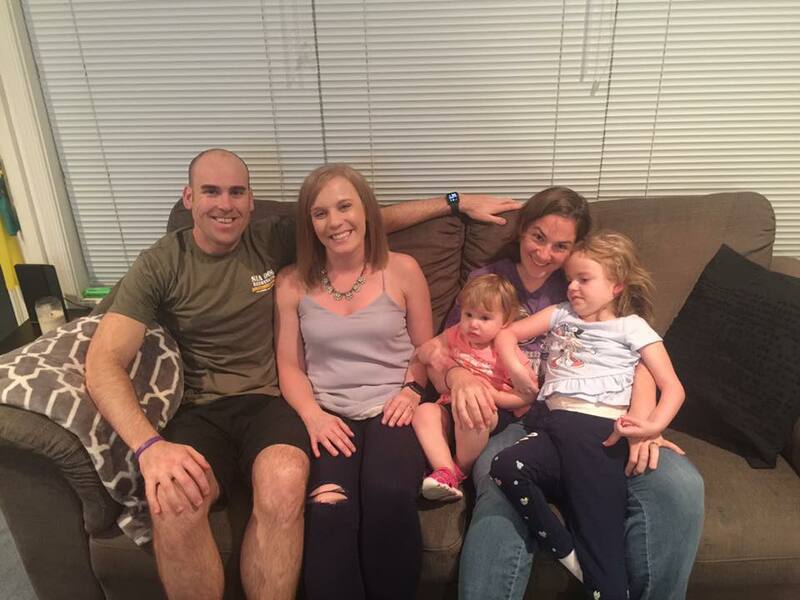 Before officially heading for home, we stopped to visit some of Kyle's cousins in West Virginia, and it was a nice relaxing way to finish our trip. 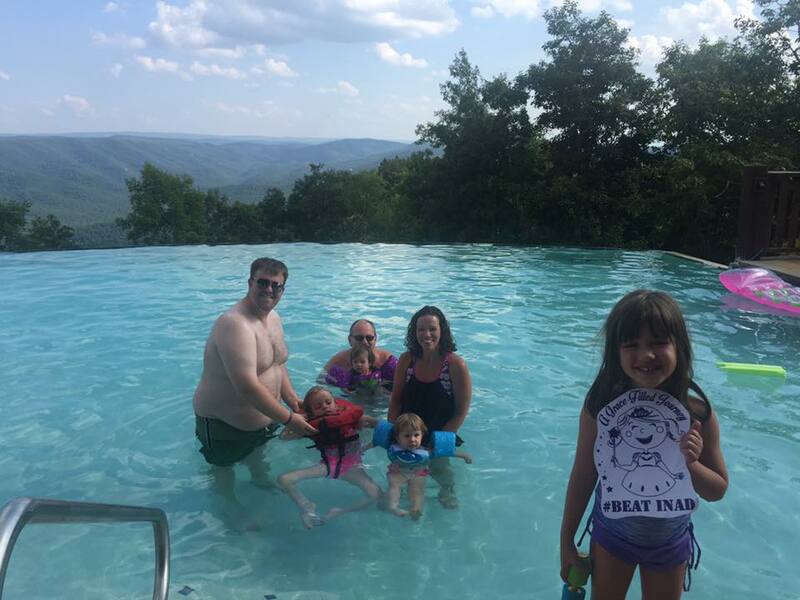 The girls got to swim in an infinity pool at the top of a mountain, and play with cousins Milyn and Jada, who they don't get to see very often. It was a really special part of the trip. Family photo op at the top of the mountain. Swimming at the top of the mountain. I can't close the blog without telling you about one of Kyle's favorite places. On the way home, we found a lack of stops between Lousiville, KY and Evansville, IN, but we needed to make a stop for lunch. We happened upon a Mexican restaurant in Ferdinand, IN, which is home to a very unique monastery and brewery. Kyle thought he would move there in a heartbeat, but we decided it might be a bit too far to commute to work every day. 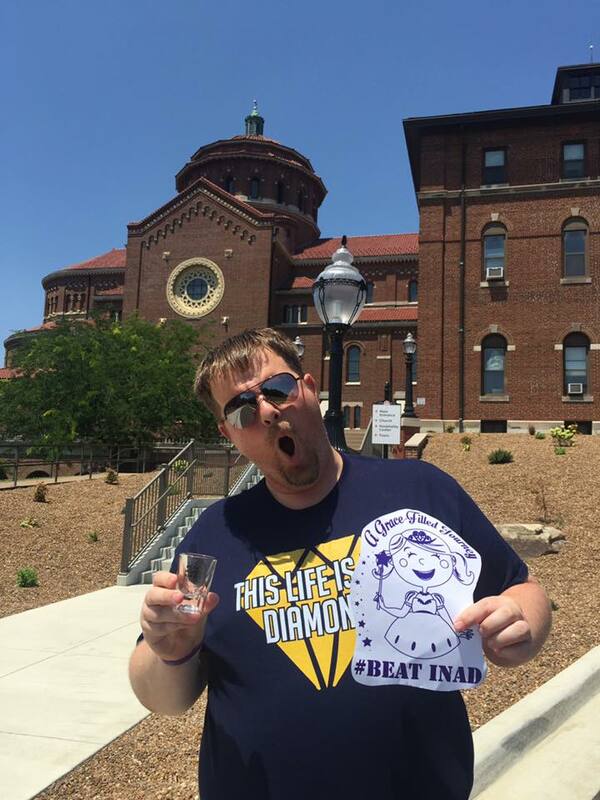 Kyle loved the monastery in Ferdinand, Indiana. All in all, we had such a wonderful trip together this year, just enjoying time together. Sometimes it's trips like this that make you forget about INAD. Not that we will don't recognize some of Grace's limitations, but there are no therapy appointments to get to, no working on anything, just being together as a family and enjoying new adventures. And with having such a great time, we can't wait to see where Flat Gracie gets to go next!